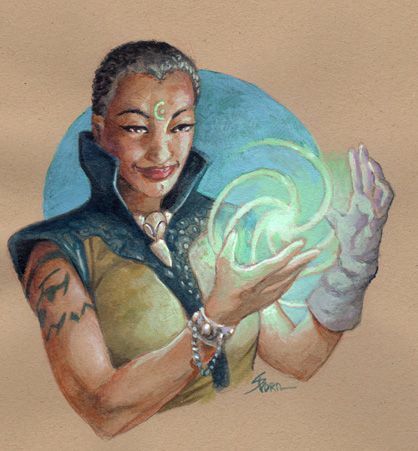 Storn's New Art thread for Perusal and Swiping! Thread: Storn's New Art thread for Perusal and Swiping! 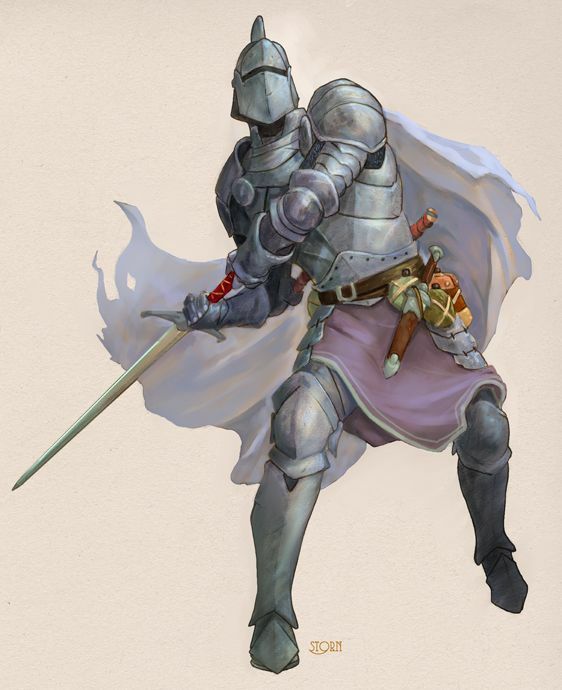 Re: Storn's New Art thread for Perusal and Swiping! Last night was the grand opening of the temporary art gallery down on the Ithaca Commons as part of the Ithaca International Fantastic Film Fest. It was a hoot!!! Steve Ellis, the coordinator of the whole dang thing, put up a 12' canvas on the wall and a bunch of us threw some acrylic paint at it. I got pics to prove it! So. Top pic, from left to right Steve Ellis, Steve Walker, Fred Harper, Cesar (who's last name I don't know but he is awesome!) and Jen Lightfoot. 2nd pic, John Haeffner, Cesar and Jen. Note for next year, prime that dang canvas!!!! Meanwhile, let me drop some my art on ya! Both of these are private commissions and the tavern scene is available as part of my LPJ Design's Portfolio Single series . The next one will be released soon as stock art, and I will let folks when that happens. And is another of the fantasy Cap America with the serial numbers filed off. Nice. It's always cool to look at some painted work. My brush-fu is weak, so of course painted work is some of my favorite. The large canvas at the film fest looks like it would have particularly fun to take part in. It was a blast! So much fun. I highly recommend doing it with anyone, artists and non artists alike! The 2 Liz’s from Whiskey Tango Sideshow were awesome! They brought very cool costumes and props and a lot energy and fun to their posing. And yes! I wasn’t making up any costuming, that is what they were actually wearing. And yes, balancing sword on her head was held for the entire 10 min pose without a wobble. True pros! Thought I would share some of my sketches done that day. 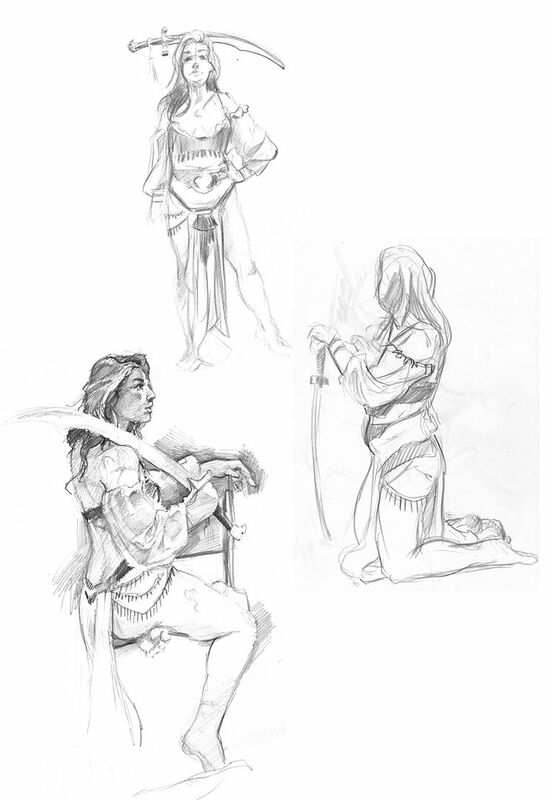 Every sketch except the sitting pose with the scimitar on the shoulder was 10-20 min poses. 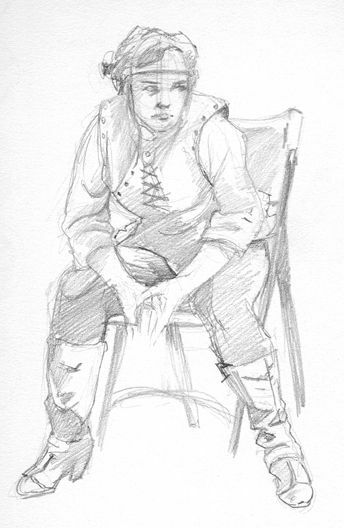 The scimitar on the shoulder was a 40 min pose. A few weeks ago, I talked about a doing some art at the Johnson Art Museum at Cornell University. This was a sketch I did then based on the “future civilization” of this massive instillation from China. Your topmost model seems to be dressed as a belly dancer. I know, I've seen that particular outfit often, as an ex of mine was a belly dancer. In addition to the scimitar, my ex also used platters of candles in her act. The scimitar on the crown of the head balancing only really gets weird when they started it spinning like top rotor on a helicopter. Again, it looks like it was a blast. Artists and illustrators (like me) work alone so much of the time, I think sometimes we forget what it's like to interact with others who practice the same or similar craft. The future dad picture looks like you got a creative jolt from the film festival. That's a good looking pic. After years of hiatus, I will be in the Champions game (RDU: Red Dragon Universe) run by Neil C. again. We are putting the band back together, using Roll20, Skype and such, hopefully starting soon. We've been doing tons of emails back and forth. I have been inspired to draw the characters, although I only have 3 done. I have to switch gears slightly to finish some interiors for Golden Age Champions. The New Pioneers are a group brought together after a decade long alien invasion of our original game. My character, Hope, is actually the daughter of my first RDU character, Vector. 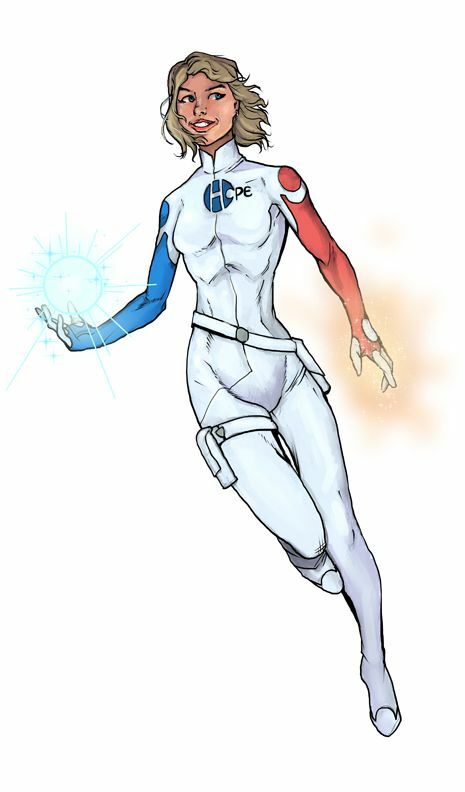 Her red sleeve represent Mars, where she grew up and the blue one represent Earth. Her powers are strength, mini-brick from her grandfather, Ultraman and light powers from her grandmother, Lady White. She has some empathic abilities and strong mental defenses from her mom. I eschewed telekinesis, because I played her dad, Vector, for years. I've done pretty much everything I ever wanted to do with telekinesis over that time. 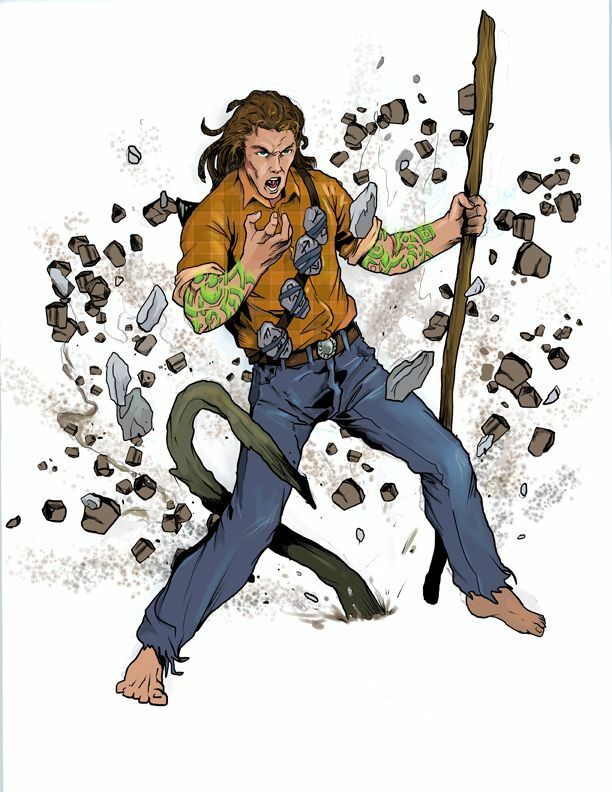 The Terran, played by Joe C, is a martial artist, with earth shaping abilities. Picked by the Gaea like force to heal the world. We haven't played yet, so I don't know all he can do. 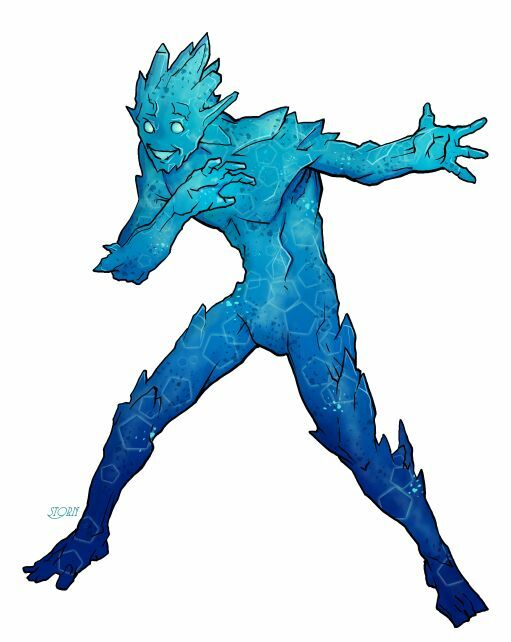 Krys is a being of pure Crystaltech, given sentience during the long alien invasion. Crystaltech was a HUGE plot point for years in RDU. Played by Bill S. He has the ability to mimic almost any energy ability. The campaign will be trying to rebuild Earth and reconnect it to the Mars colony. Mankind has been devastated, population is down to 1 billion souls. I am really looking forward to the next chapter of RDU. More to come, perhaps next week. I still have Myrk, Shocks and The Blue to still do. 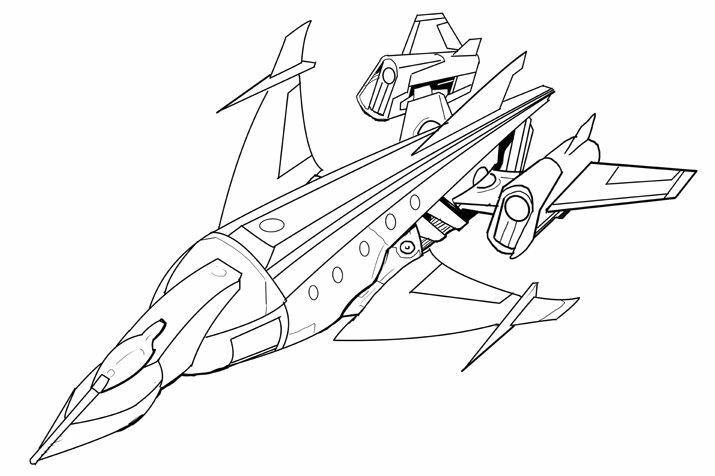 And oh yeah, I want to do a pic of our shuttle craft too. My character, Hope, grew up on Mars and has a passing familiarity with spaceships and various vehicles. I believe Myrk also has piloting as one of his skills. Neil, the GM, sent out an email describing our approach to the Spire using the STS-014m, built at the martian shipyards and is a space shuttle and VTOL. So damn… I had to draw that! I shared a couple of pics from my upcoming Champions game earlier. I’ve gotten a couple more done and now that is up as a Clip Art portfolio from LPJ Designs for publishers who might need some super hero art. You can preview all 5 pics before you purchase. And I have several fantasy and super hero clip art collections that might fit publishers needs in addition to the newest one. Here are a couple of the pics that have not been posted yet that are in that collection. 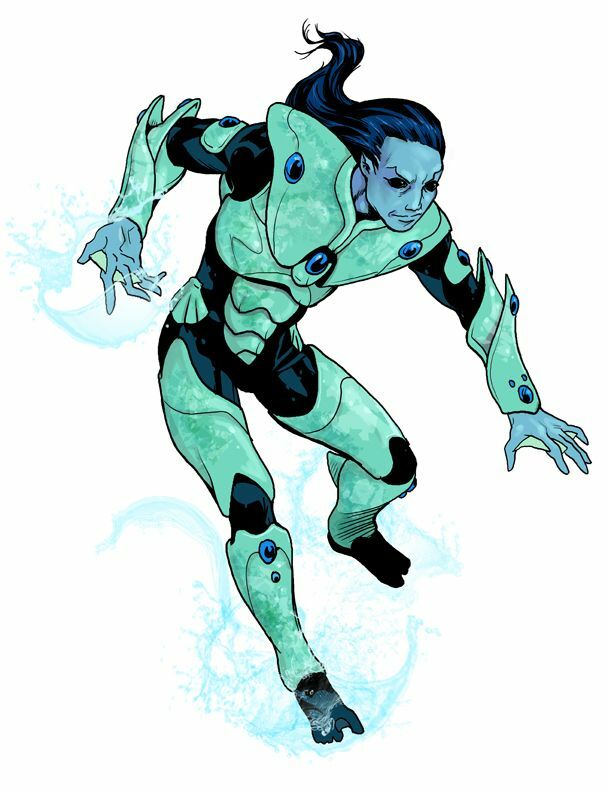 We have The Blue, a Lemurian immortal mage, now coming out of seclusion to help rebuild the world. Played by Geoff. An extensive multipower of water based magics. 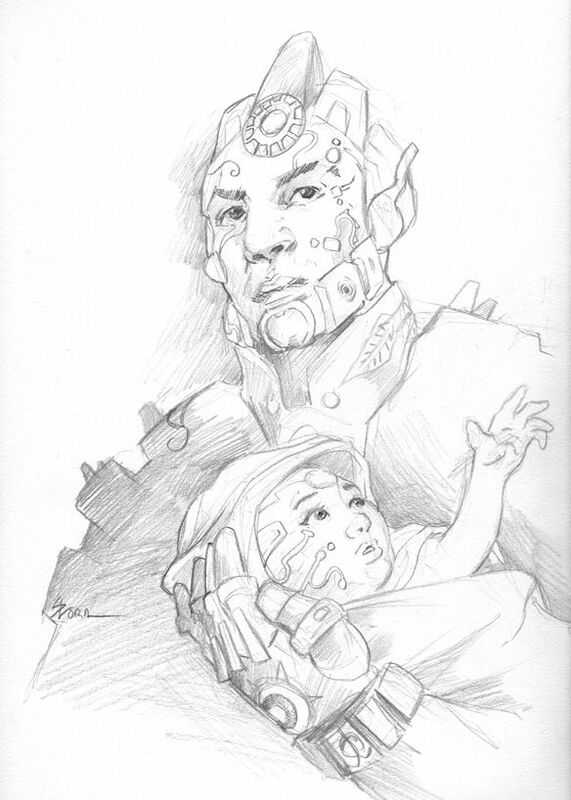 And we have Myrk, a hybrid of two alien races, one of which looks quite huminoid, the Tresselaines. 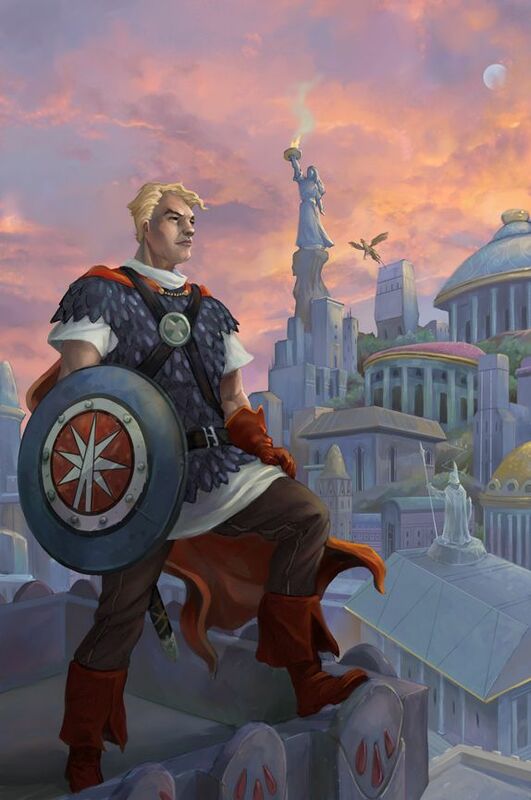 The published Herculon from Champions Enemies is a Tresselaine (I believe). He was on Earth during the 10 year Invasion War fighting for Earth. 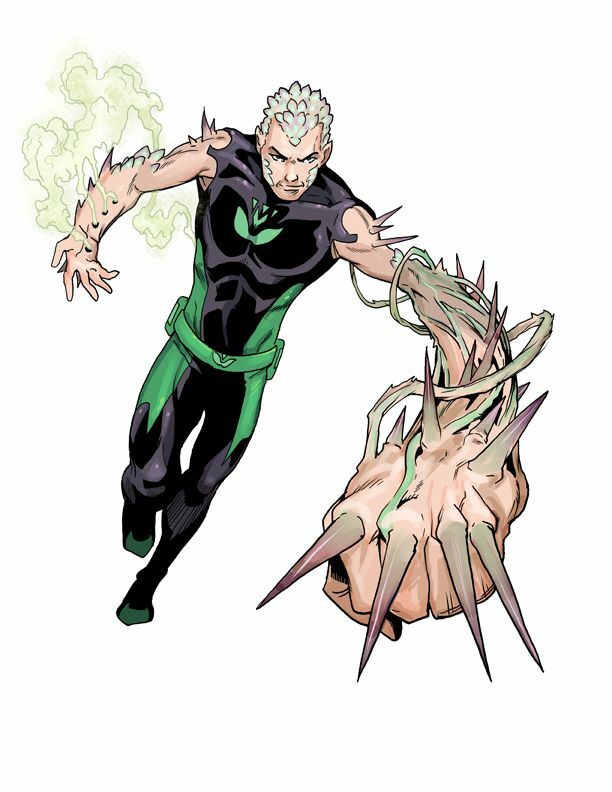 He is a brick with certain fungus and plant abilities like stretching due to vines and spikes. Played by Rick. Here is a private commission I finished a few days ago. 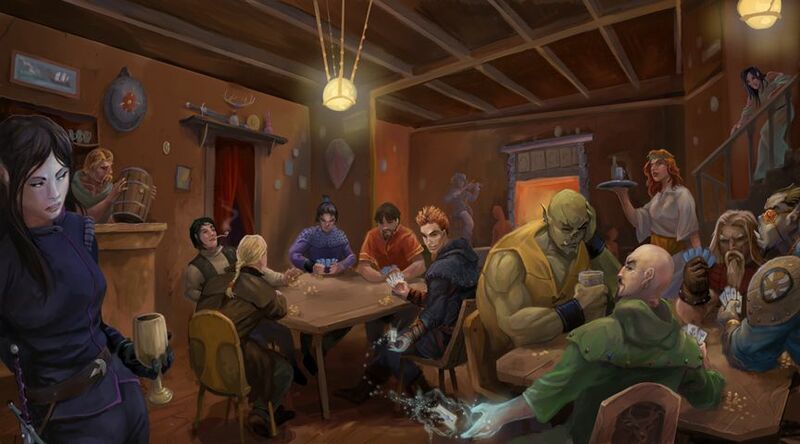 For a D&D game, hence potions and hand axes had to be incorporated somehow into the image. He wanted a somewhat action shot. Hope I succeeded. Coming to a clip art portfolio near your home town soon! I used to partake occasionally in a contest over at Ten Ton Studios. I had a lunch hour free and thought I would do my first Ten Ton Studio challenge in several years. If you are a member of Ten Ton, you get to vote on the winner. This week's challenge is Superboy. The challenge just started and runs to 9am Thursday. Not a lot of time to get stuff in. But it is always fun to see what is produced. I did my entry in pencil, ink and color pencil. So, my mother in law died last week, early Monday morning, to be specific. Sad, but expected. She was 80. Much beloved. I was in Puerto Rico for the funeral and just got back in last night, late. But right before she died, I had done some artwork for commissions, the two superhero pieces. Happy accident time! I totally had a dyslexic moment and the Honey Badger commission called for a male. 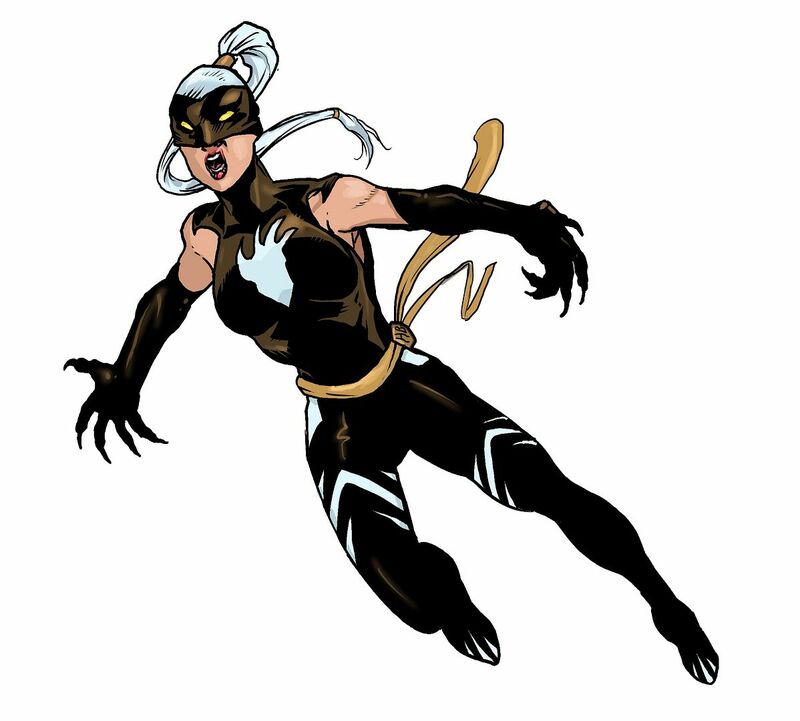 But in my brain, I thought I had read female and I drew Honey Badger as a woman villain. (It was the term "Honey" that threw me, so sexist of me). The patron really liked it and didn't take me up on my offer to redraw her as a man after I found out my mistake. I also really like the Cloud concept. 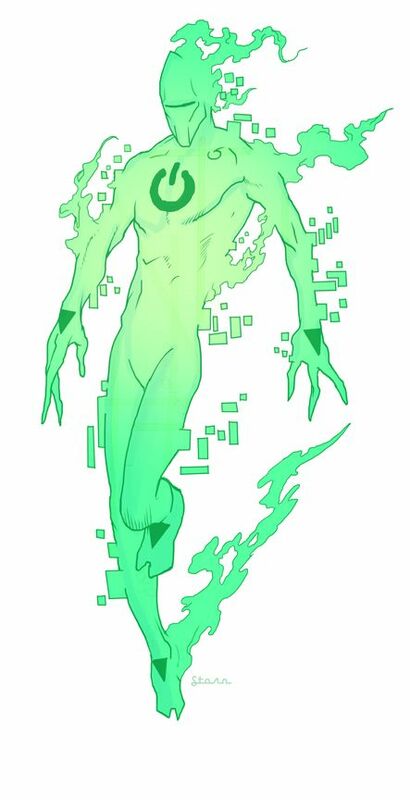 He is a shapechanging, digital entity who resides in the Cloud. That is a scary concept, guess you have to lure him out to like rural-off-the-grid New Mexico or Canada in order to truly defeat him. Good luck with that y'all. And I fooled around on a painted piece after watching Steve Prescott's painting video with heavy body acrylics. After pestering Steve and asking a few questions about heavy body acrylics, which I had never used, I went and got a couple of tubes (burnt sienna, white, black). I had doodled that drawing in my toned color sketch book and despite it being fairly thin paper, I went to town with the acrylics. The underpainting is the heavy body acrylic, but the color work was done with some guoache I had lying around. Bottom line; I really like the Liquitex heavy body acrylics, they stay wet a nice long time. Easier to blend and mix. So thanks Steve! All times are GMT -7. The time now is 08:18 AM.